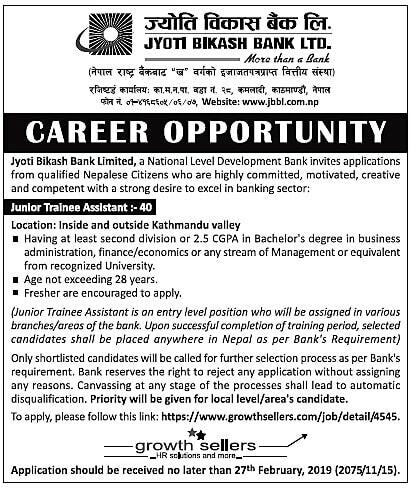 Home / Banking jobs / Vacancy / Career Opportunity at Jyoti Bikash Bank Limited; Required Junior management Assistant - 40. Career Opportunity at Jyoti Bikash Bank Limited; Required Junior management Assistant - 40. Having at least second division or 2.5 CGPA in Bachelor's degree in business administration, finance/economics or any stream of Management or equivalent from recognized University. Age not exceeding 28 years. Fresher are encouraged to apply. Application deadline: No later than 27th February 2019 (207/11/15).